Holiday perks include heated indoor pool, Jacuzzi and sauna. 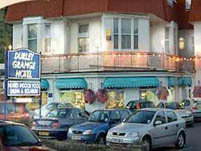 Tucked in a quiet, secluded position on Bournemouth's popular West Cliff. Wedged neatly between the award-winning Upper and Lower Gardens, the Durley Grange offers a fun yet homely base for a sizzling Summer holiday or a wicked winter warmer. Young and old talk very fondly of it and the family running the hotel aplly themselves admirably to the task. There's clearly a lot of affection and love goes into the place. Each of the 52 bedrooms have en-suite facilities, colour televisions, direct telephones with alarm clock and tea and coffee making facilities. During the summer months, the hotel's Mediterranean style sun patio offers the ideal setting for a bit of tan-topping and there's a variety of entertainment and dancing almost nightly. You also get a sauna, an indoor pool and a hot tub to keep you occupied.